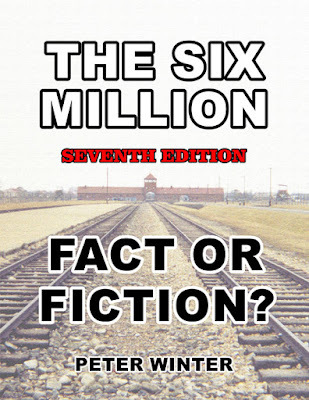 I am happy to announce that the very latest edition of The Six Million: Fact or Fiction? (7th edition) has now been released free to read on the internet. I have taken this step in response to the decision by Amazon worldwide to ban the book from sale on that platform, in response to agitation from assorted Jewish organizations, including the ADL and Yad Vanshem. The Jewish organizations said in their pleas to Amazon to ban the book that the "threats against Jewish Community Centers" which were so rife in the US in 2017 were "evidence of rising anti-Semitism" and that therefore books like The Six Million: Fact or Fiction? needed to be removed from the public arena. As everyone now knows, the "threats against the Jewish Community Centers" all came from a Jew, Micheal Ron David Kadar, in Israel, who was only arrested after the US sent the FBI to that country, because the Israeli police had not acted against him. Needless to say, when the US asked Israel to extradite Kadar, the request was refused. So it turned out that it was all a set-up, albeit one with which Amazon played along willingly. 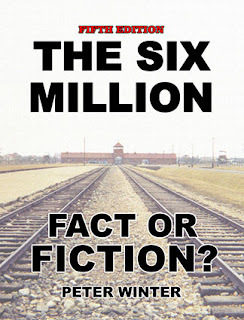 In reaction to this draconian and unwarranted censorship, I have waited until International Holocaust Remembrance Day, January 27, 2018, to prepare and release free on the Internet the very latest updated edition of The Six Million: Fact or Fiction? I will also be releasing PDF and ebook versions, and soon a torrent file as well. The book is being released for non-commercial purposes only, so please respect that. But for now, read the whole book free by going to its new site here. If you want to support my efforts, please do consider buying a hard copy from the brave booksellers who still stock the book (click on the advertisement to the right please). The censors must know that we will never back down until this wall of lies collapses under its own weight. Banning books off Amazon is merely an indication of the fact that they know their claims cannot stand up to rational investigation. Now is the time to increase the pressure! God bless you Peter. Stay strong. Peter. I am thrilled to see you have made your amazing book "The Six Million: Fact or Fiction?" available free online and am doing what I can to promote it to others. I already have 2 hard copies, 4th and 5th ed (I like a book in the hand). Your book was instrumental in providing my family the proof that we have all been conned - Six Million Lies! So thank you. Are you aware of John Wear's excellent website? John is a writer for The Barnes Review journal and his focus is on bringing the history of World War II into accord with the facts. A heroic action. Well done! Truth will set us free. However, most people don't want to be free of the historical lies they've been fed all their lives by the usual suspects.